(NaturalNews) Magnesium is an important mineral to include in your diet – and yet it's not something you hear about on a regular basis. You are probably aware of the importance of calcium or iron for your health, however you might not realize that adequate magnesium levels are crucial for brain, cardiac and muscle function, as reported recently by Natural News. According to Ancient Minerals, magnesium is vital; without it we would not produce energy, our muscles would be in a permanent state of contraction, and we could not adjust the levels of cholesterol produced and released into the blood. Magnesium is also needed, along with silica and Vitamins D and K, to promote bone health. According to Life Extension, a shocking 68 percent of Americans do not consume the recommended minimum daily requirement of magnesium. And a staggering 19 percent do not even consume half of the government's recommended daily intake. 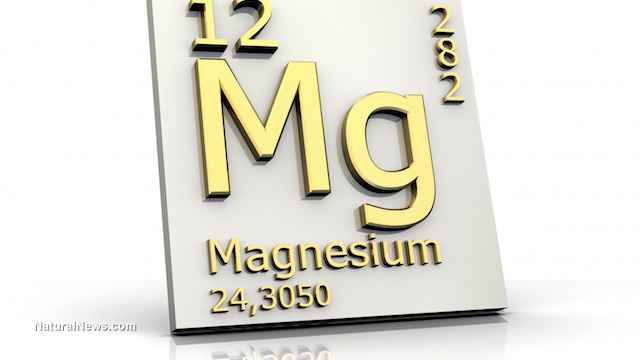 Otherwise known as tinnitus, a constant, high-pitched ringing in your ears is a common symptom of magnesium deficiency, as reported by Natural News. According to various studies that examined the relationship between ear health and sufficient magnesium levels, it has been found that sufficient quantities of magnesium will actually prevent the formation of free radicals that can lead to hearing loss. Your muscles function because of magnesium; without it, your body would be in a state of convulsion and your muscles would be unable to relax. Lack of sufficient magnesium can cause facial tics, muscle cramping and twitching of the feet while trying to sleep. There is a long established link between low levels of magnesium and depression, and for over a century, doctors have used it to treat mental health disorders. A recent study in a psychiatric hospital in Croatia found that many attempted suicide patients had severely low levels of this crucial mineral. Of course, the benefit of treating depression with magnesium is that it doesn't have the side effects associated with chemical medications. Because of magnesium's effect on muscles, low levels of this mineral can affect your heart and induce a condition known as cardiac arrhythmia. This is when your heart does not beat regularly, and the condition can cause other complications, such as heart attack and stroke. While some scientists say that kidney stones are the result of too much calcium, others believe that it is a lack of magnesium that is the main culprit. Magnesium prevents the formation of kidney stones by preventing calcium from binding with oxalate. According to News Max, fruits such as bananas, oranges, cherries, pineapples and avocados are rich sources of magnesium and have many other health benefits. Mackerel and shrimp are particularly high in magnesium; 100g of mackerel provides approximately 95 milligrams of magnesium. Milk, butter, cheese and yogurt are rich sources of magnesium, with 100g of yogurt providing 20 milligrams of magnesium. If you're a lover of chocolate, you'll be pleased to learn that it is high in magnesium and aids good mood. 100g of dark chocolate provides a whopping 320 milligrams of magnesium, so go ahead and indulge!